I was prepared to present you with the biscuits at the top left hand side, there. I wasn't really proud of them. 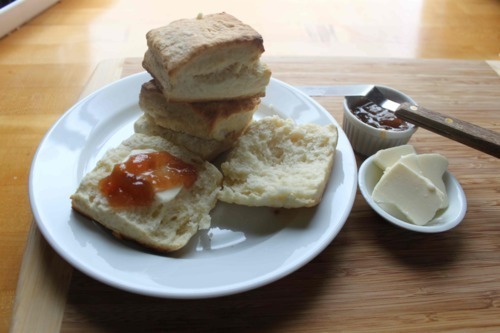 They were the most tender biscuits I had tested so far, but they didn't have the flavor I've been searching for. You see I have had a biscuit problem for a while now. They were always tough, or flat, or dry, or soggy, or too crispy. Sure, I had a cheese biscuit I made regularly for Brian and my family. But it always felt fussy and, sort of, well, Northern. 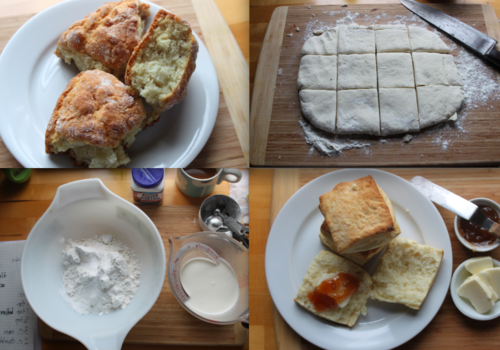 I tried a lot of biscuit recipes (including this one, this one and this one.) But I had not found a biscuit I would call my own, so I kept trying. All that trying left me with a lot of misconceptions about biscuist and some terrible blues. I was kneading too little, or working the fat in too much, I was rolling them too thin or too thick, my oven was rising, my oven was low and slow, I was using a cake pan, a 13x9 pan, a sheet pan, I was mixing my own baking powder. And yet I was never happy the biscuits. This week at RCA, I attended a session with the notorious Gena Berry and she shared Shirley's Touch of Grace Biscuits. For the first time I thought I was on the right path to finding a biscuit recipe that I liked. Last night I made them for Brian, with sausage gravy and, well, we didn't like them. The texture was right, they were just too sweet and I wasn't loving the shortening and two kinds of flour. But I took their picture and prepared myself to share them with you all - proud or not. Then some sort of biscuit miracle happened! While browsing bloglovin' late last night, I saw that Molly Wizenberg had written about Marion Cunningham's cream biscuits. I dreamt all night about dough and flours and biscuits flat as pancakes. I got up early this morning to find I had almost everything I needed, cranked the oven and went to work. I tweeked a few things - using more salt and less sugar and most importantly, using southern flour. Molly had promised moments of doubt. The dough looks so thin when you roll it out, it is hard to imagine that it could produce any thing other than hockey pucks. But what came out of the oven was heaven - light and crispy, salty and buttery. And my biscuit blues disappeared as quickly as the biscuits themselves. Combine the flour, baking powder, salt and sugar in a large mixing bowl. Add the cream, 1/2 cup at a time, stirring gently with a wooden spoon. The mixture should be wet, but not super sticky. (I only used one cup today, but it has been wet and cold in Atlanta). Gently knead on a floured surface for one minute. Roll the dough to about 1/2 inch thick. Cut into 12 squares (next time I will probably use a pizza cutter for this). Place evenly apart on an ungreased baking sheet. Brush generously with the melted butter and sprinkle with kosher salt. Bake for 15 minutes or until tall and golden brown. Devour immediately.